This is an easy, and quick dish to prepare. One pot meal, short on cooking time, and oh so delicious! In a large skillet or wok stir fry add oil, stir fry the chicken, garlic, onion salt and pepper(s) for about 5 min or til chicken no longer pink. Place in bowl with light cover. In same skillet add all the veggies and butter until slightly tender. Add soy sauce and lemon juice, and shrimp and return the chicken mixture back to pan and heat through. 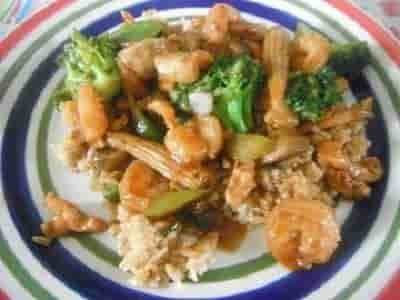 Note: Julie says "Trick with the cooked rice I add an additional 2 TB soy sauce to this for flavor and color. Enjoy!" Recipe and photo courtesy of Julie Mousseau Rockwell. Used with permission.